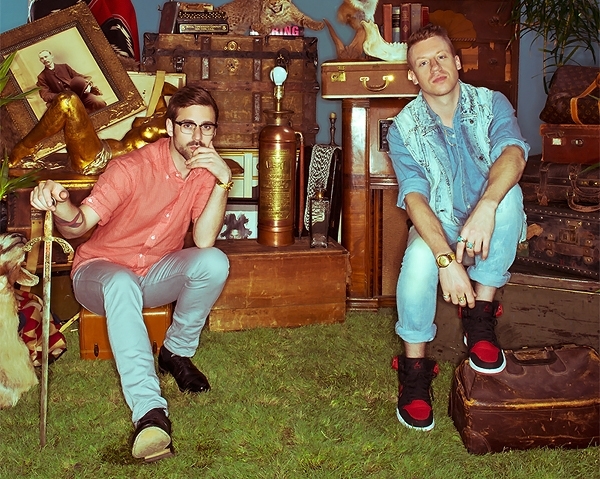 This week’s Artist of the Week is the hip hop duo know as Macklemore and Ryan Lewis. Hailing from their beloved hometown of Seattle, WA., the pair, who have been fighting their way onto the scene for a while now, are finally cashing in on the success that persistence, a loyal fan base, propensity for fake fur and 10,000+ hours of logged studio time studio will get you. Macklemore (real name Ben Haggerty) is the band’s rapper and front man while Ryan Lewis is the band’s producer and DJ who creates and spins all of the beats. The pair met roughly “6 or 7 years ago” according to Haggerty and have been working as a collaborative team ever since. Recently, they released their debut studio album called “The Heist” on October 9, 2012, which entered at No. 1 on the US iTunes download charts and No. 2 on the US Billboard 200 charts, selling 78,000 copies in the first week. 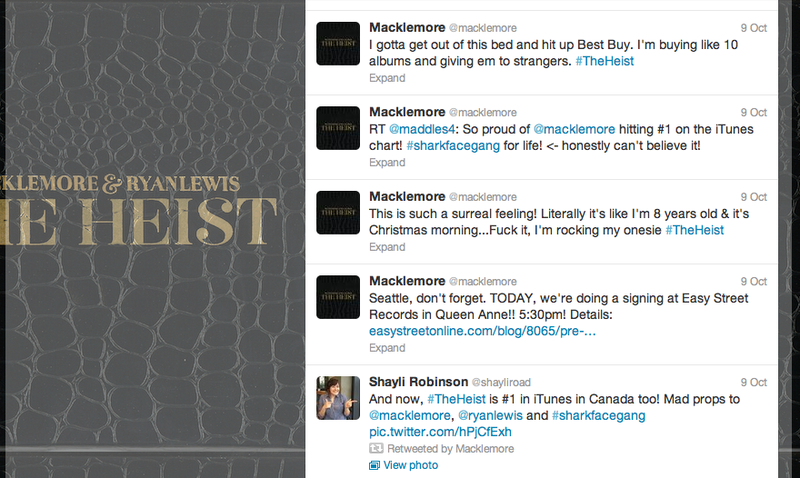 On the night the album was released on iTunes, Haggerty kept tweeting about his disbelief, his excitement and his appreciation for his fans. 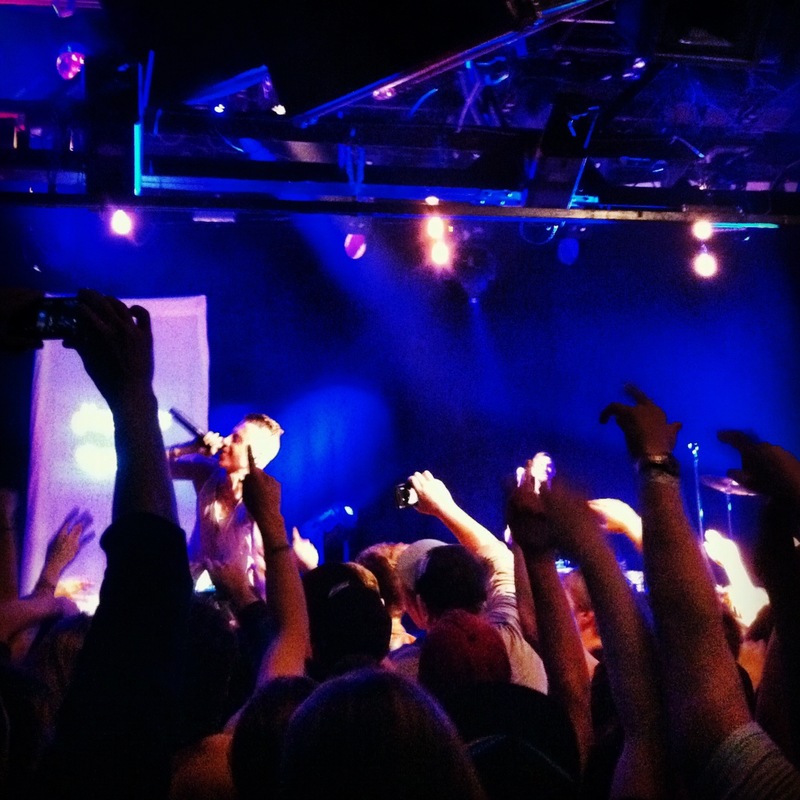 While Macklemore and Ryan Lewis are defined as a part of the rap/ hip-hop world we all know (and sometimes love), the content of their songs is what sets them apart from other artists attempting to do the same thing. Instead of rapping about strippers at the club or how many gang fights they had to get in in order to be considered street, they rap about topics that are truly personal to them and have a clearly defined message. For example, their song “Otherside” talks about how Haggerty struggled to beat drug and alcohol addiction for several years and how he’s finally sober, having made it to the “other side.” According to Haggerty, he has received a lot of feedback from fans who said they were dealing with similar issues and found strength and solace in listening to his song and story. However, one of the many facets of Macklemore and Ryan Lewis’ beauty is the fact that their music, and more specifically their latest album, isn’t comprised of a bunch of the same songs. In fact, it could be argued that their diversity and variety is what’s making them so popular; they have a song for everybody. While some songs are heavy and deal with serious topics such as “Otherside”, and more recently a follow up song called “Starting Over”, they have produced plenty of light-hearted songs such as “And We Danced”, which talks about enjoying a really great impromptu dance party. The pair has also produced several songs that comment on civil rights topics and societal issues, such as racism in their song “A Wake”and the dangers of consumerism in their song “Wing$”. Known for their artistic and high quality music videos, several of the band’s music videos have gone viral such as the one for their single “Thrift Shop” (which is played regularly on BET) and also “Same Love” (which has been viewed on YouTube more than 30 million times.) Upon noticing the stir that the “Same Love” video was generating (which is a song promoting marriage equality), Ellen DeGeneres (of the talk show “Ellen”) had the band on the show for a live performance of the song and gave everyone in the audience a copy of their CD. I chose to make this duo the Artist of the Week because in light of all of this overnight success, they remain humble and appreciative of the fans who got them to where they are. They remain loyal to their roots in Seattle, giving shout outs left and right, and also never forget to thank every last person who made it possible. In their song “Ten Thousand Hours”, the chorus sings, “Ten thousand hours felt like ten thousand hands,/ Ten thousand hands, they carry me.” Whether this refers to the physical hands supporting them as they crowd surfs at sold-out shows or the metaphorical hands of those who have been cheering them on from the start, the fact that they stop to say thank you in the very first track off their album speaks volumes, regardless of what sound system it happens to be playing on.